We have returned from another fantastic trip to Komodo National Park. This time we were on board the MSY Wellenreng, a 22.5m traditionally built wooden vessel with only 3 spacious cabins. We had some familiar faces on board as Steve from Dive 90 returned with his spouse Eileen bringing along Trevor, Helen and his brother Nick and Tessa. 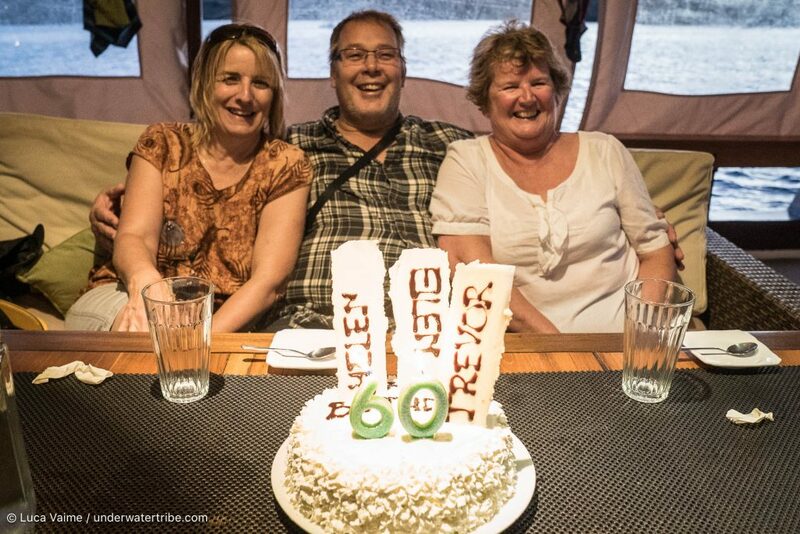 This was a special trip for all of us as Trevor, Helen, and Eileen were all celebrating their 60th birthdays on this trip. For 10 days we dived with mantas and sharks on pristine reefs and encountered incredible macro sites while cruising around the calm waters of Komodo National Park. We departed Bali early in the morning and arrived in Labuan Bajo, Flores around 11 am. We boarded the MSY Wellereng and left the harbour right away. We had lunch before reaching our first destination and had great sea conditions. We arrived at Sebayor around 14:30 and went for an easy check dive followed by a little hike to the island of Sebayor Besar. We spent the night at the anchorage between Sebayor Besar and Sebayor Kecil. We had our first taste of “Komodo Currents”. The falling tide was running the whole morning so we decided to dive the long reef of Tatawa Besar. 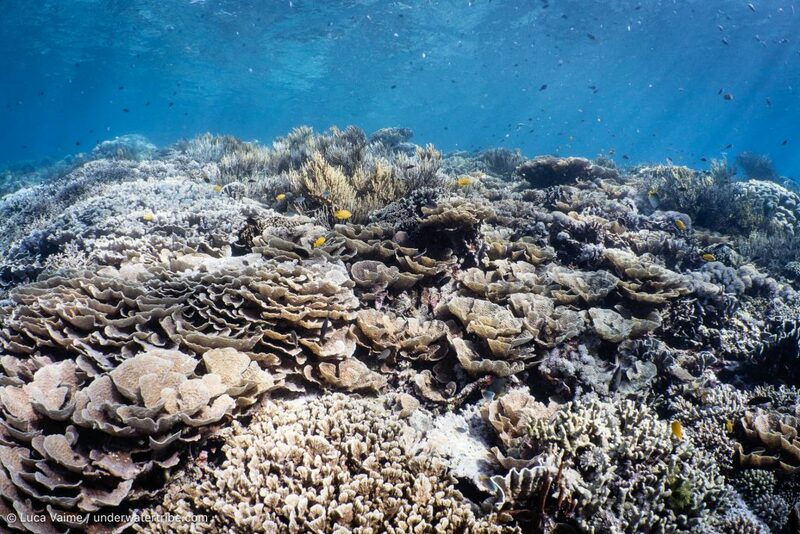 The hard corals were magnificent and the soft corals were wide open, feeding on the nutrients brought in by the current. 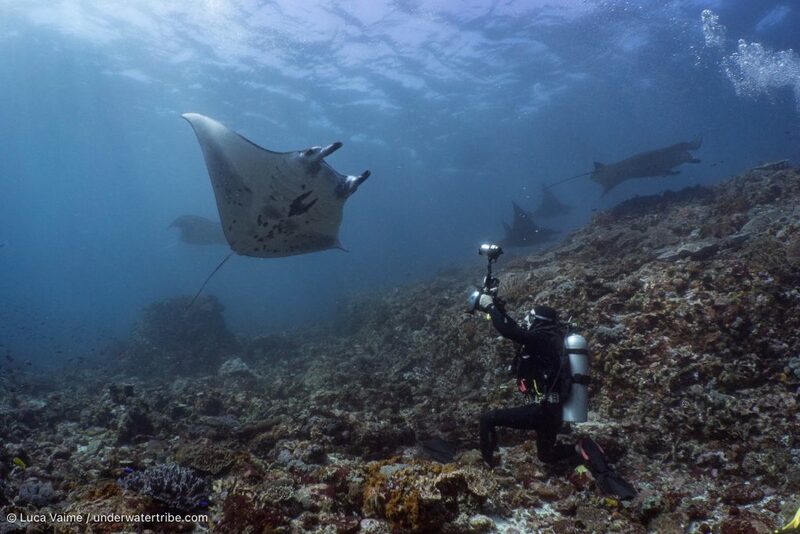 For the second dive we went to Karang Makassar hoping to see our first manta of the trip. The tide was still falling and we were lucky enough to see 3 mantas on this dive. We ate lunch while motoring south to Loh Liang and went diving at Pink Beach. We spotted a lot of critters during the dive including a very big cuttlefish. After the dive, we decided to navigate another hour south to spend the night at Lehok Serah so that the following morning we could save an hour of navigation and sleep a little longer. 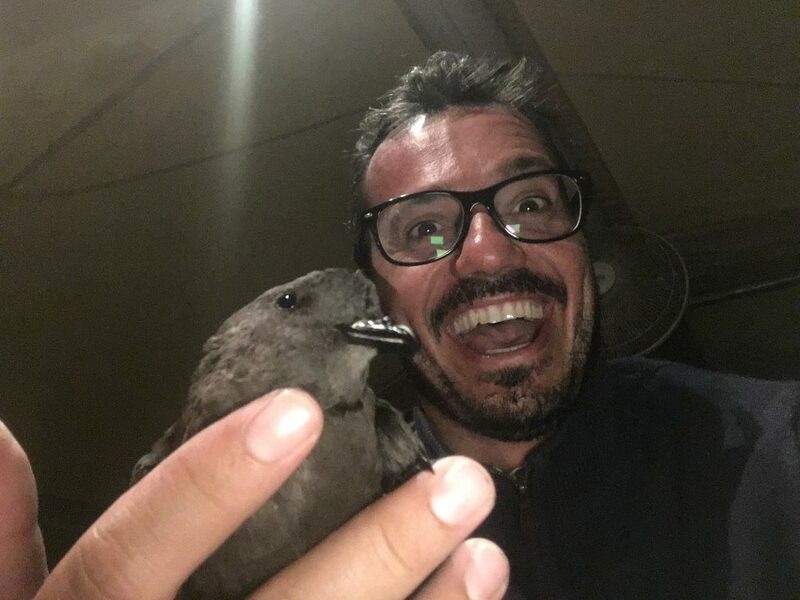 In the evening, after dinne,r while relaxing and chatting in Lehok Serah we had a special visitor when a bird landed on Luca and decided to spend a few hours resting on the Wellenreng before taking off early in the morning. We started the third day comfortably at 7:30, when we raised the anchor and made our way to Manta Alley. We decided to have a late start as there were at least two other boats heading to Manta Alley. This ended up being the perfect plan because as we entered Manta Alley, the other boats had finished their first dive and we had the dive site to ourselves. On the first dive, we descended to the cleaning station and waited for few minutes to see if any mantas were cleaning. After waiting for a few minutes without success, Luca decided to take the group towards the “Alley” and “Boom!”, mantas galore cruising in the current. We settled down in position to admire at least 10 or more mantas that were hanging on top of our heads facing the current. Even though the water was chilly, with a great dive like that we forgot about the temperature and admired the beauty and elegance of the mantas. During the break, we had a nice breakfast before we went for a second dive. This time the mantas were down at the cleaning station and we spent several minutes watching different individuals rotating on top and around the cleaning station. It was great to have two dives showing two different manta behaviours. Once lunch was over we left Manta Alley and headed to the island of Padar, which we reached at around 4 pm. Steven, Nick, Luca, Evan, and Derek went to the hike in Padar to admire a beautiful sunset. The evening continued with a relaxing dinner in the calm waters of Padar island. We left Padar island early in the morning and arrived in Horseshoe Bay at approximately 7:00 am. We were lucky enough to be able to take the mooring right next to the infamous “Dragon Beach”. The weather was just perfect with sunny conditions and a light breeze. We made our first dive of the day at Cannibal Rock and we had a great dive. 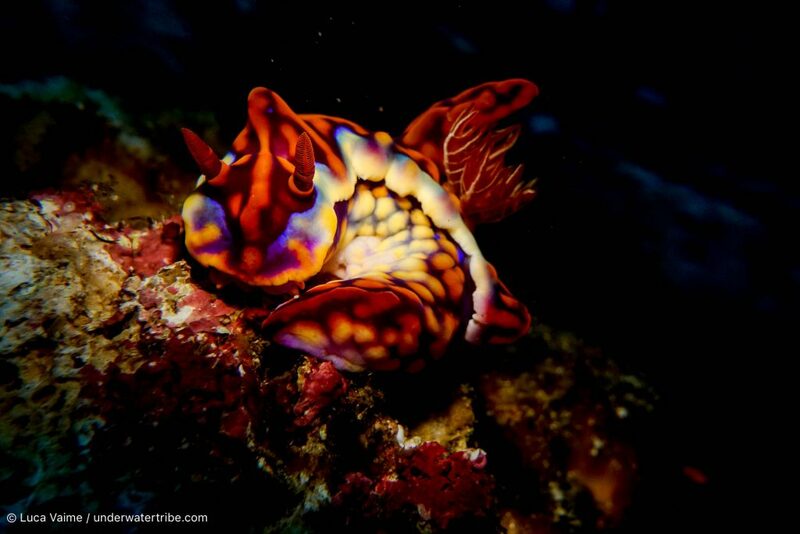 We spotted several nudibranchs, including one of the most wanted ones, the Ceratosoma magnifica. 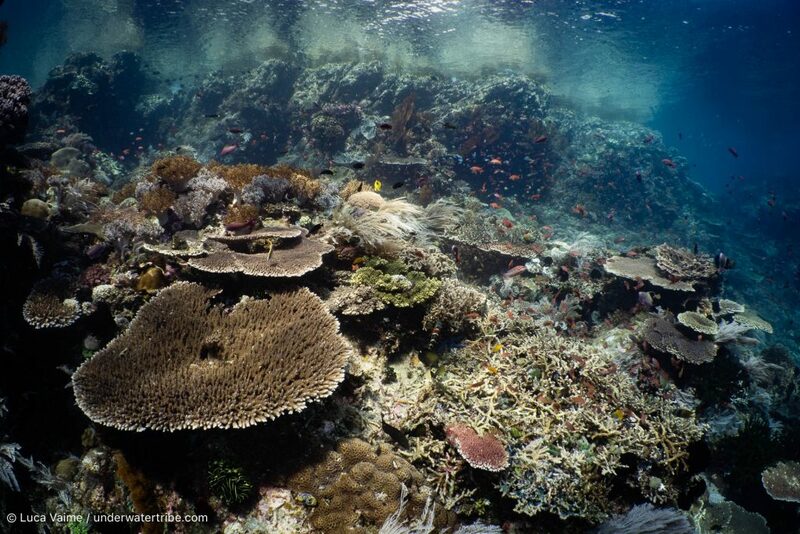 The corals were all out feeding and the visibility was a good 15 meters, which for this area is very decent. For the second dive of the day, we went to Yellow Wall and had a very beautiful dive with plenty of critters too see including the famous lady bugs. After a nice lunch, we went to Boulders for the afternoon dive and this dive site did not disappoint. We found sea apples feeding, a pikachu nudibranch, a beautiful cuttlefish, and several other interesting nudibranchs. 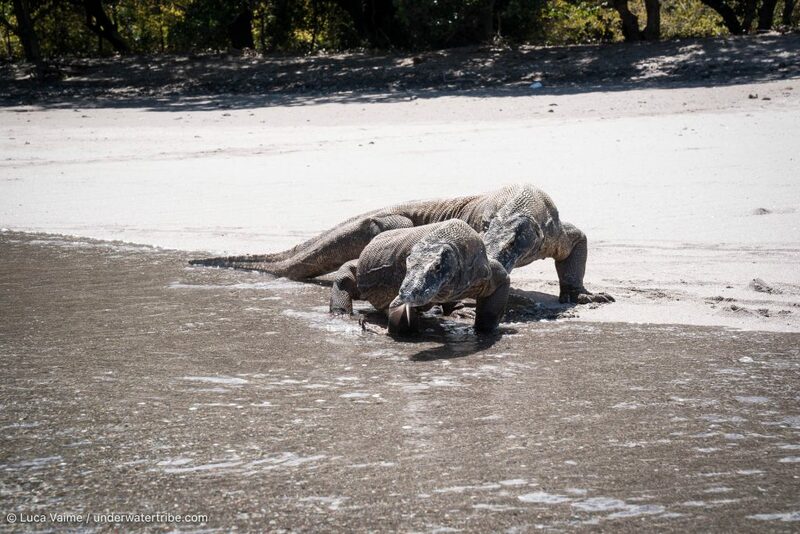 Once we returned from the afternoon dive, we ate a snack and went to the beach to meet the Komodo dragons. We had perfect conditions and light and were lucky to see 6 dragons at the beach. To finish the day in a perfect manner, we went for a night dive at Torpedo Alley and found many interesting critters as well as a little torpedo ray. We started the day in Horseshoe Bay and dived Rhino Rock, we found some very beautiful nudibranchs on the coral slope and other interesting critters. The highlight of the dive was not a small critter but an adult Bamboo Shark passing quite close to all of us. The dive was nice and easy with only a little current. During the break we had a nice breakfast and relaxed watching the animals on the nearby beach, we spotted crab eating monkeys, a couple of wild boars, and few Komodo dragons. For the second dive we returned to Cannibal Rock. 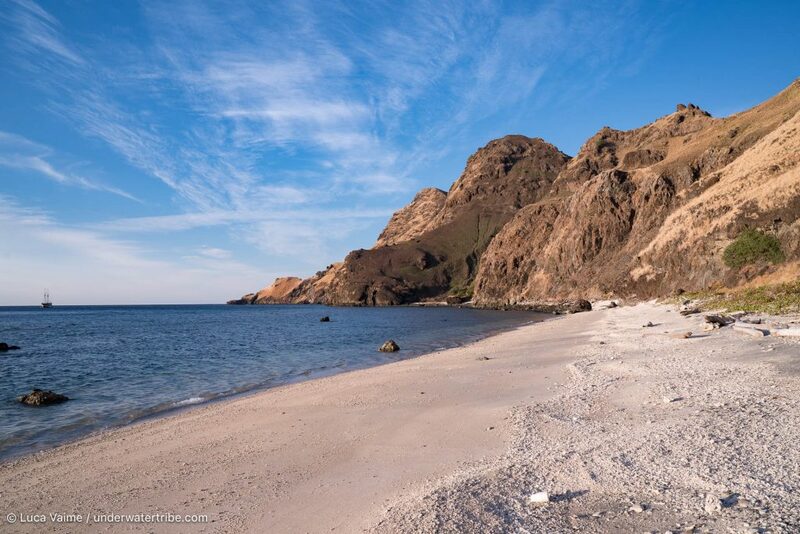 We couldn’t leave this beautiful bay without diving this amazing site at least twice! We saw plenty of beautiful nudibranchs and had great conditions underwater with a mild current. This time we found several sea apples feeding. Thanks to the good visibility, we were also able to admire the abundant fish life on the reef. Once we finished Cannibal Rock, we ate lunch in the sheltered waters of the bay and then headed back north with the rising tide. We made good speed and arrived in Gili Lawa Darat (North Komodo) at 16:00 pm. This time we decided to relax and instead of going for a dive we all went on land to watch the sunset from the hills of this small island north of Komodo. Stephen, Luca, and Derek conquered the summit of Gili Lawa Darat island and watched the beautiful panorama from the top of the hill. 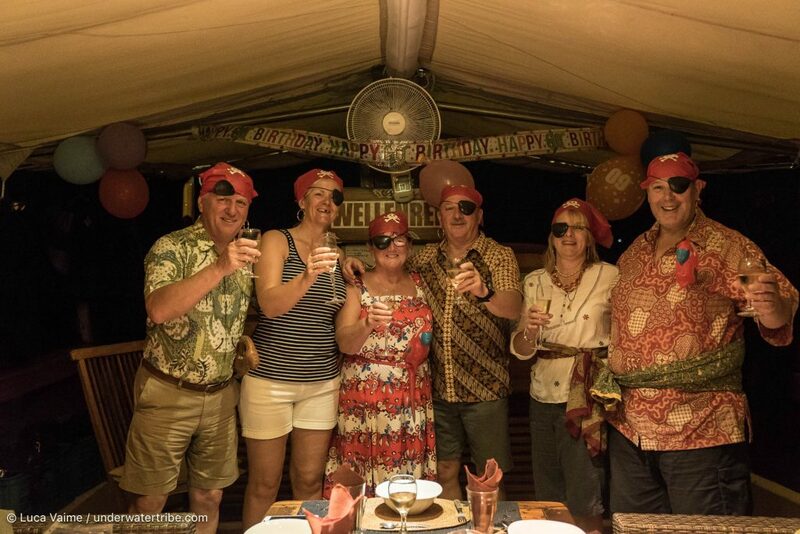 When we returned to the boat, the crew surprised us with a nice birthday welcome as we celebrated the 60th birthday of Helen, Eileen and Trevor. They prepared a great cake and adorned the boat with birthday decorations. To make it even more fun, all of the group dressed up like pirates. 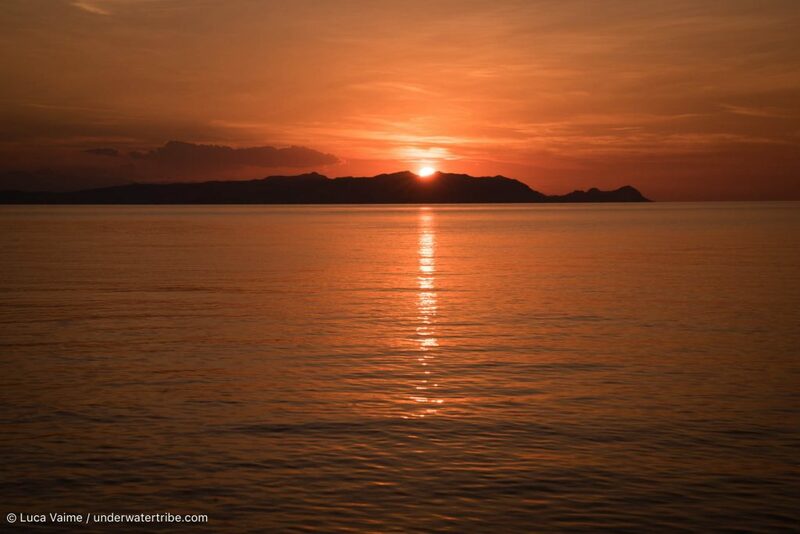 It was a lovely evening to finish a beautiful day in the Komodo National Park. Conditions were perfect and we managed to execute this beautiful dive perfectly. We encountered giant trevally, a black tip reef shark, a white tip reef shark, and three juvenile manta rays. At the end of the dive, once we were out from the current, we encountered a couple of turtles feeding on the coral slope. A very good dive to start the day! 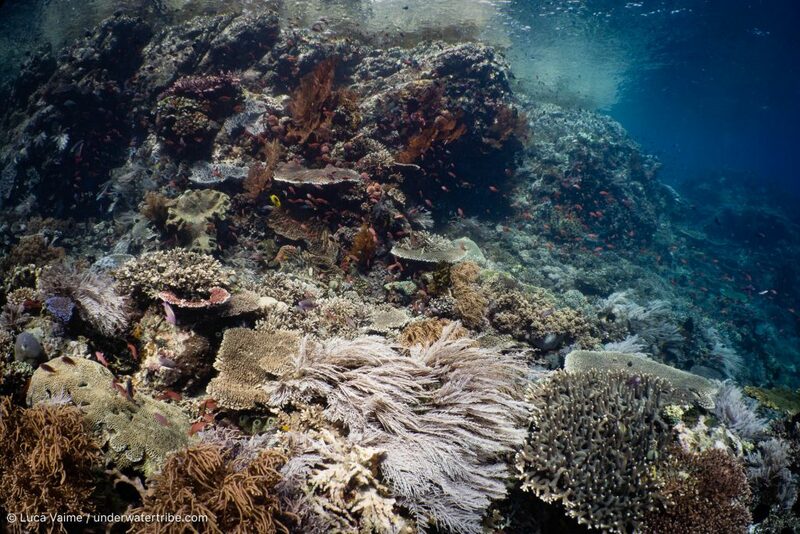 For the second dive we moved to Gili Lawa Laut as the tide was perfect to dive Castle Rock. In fact, when we jumped in, it was the end of the falling tide and we managed to stay in front of the current on the west side watching a big school of surgeonfish, fusiliers, and banner fish being herded by giant trevally and big-eyed jacks. The visibility was very good and we were all happy to be back in warm water. We ate lunch nearby as we wanted to make the third dive of the day at Crystal or Castle Rock with a little bit more current and few other boats around. Given that conditions were favourable, and that almost all the other boats in the area jumped at Crystal Rock, we jumped at Castle Rock again. The moderate current kept the fish in tight schools and while several white tip reef sharks cruised in the background. There was a huge school of fusiliers and even a grey reef shark appeared a few times. We then moved the boat to the west side of Gili Lawa to enjoy a beautiful sunset. The morning started with a dive at the famous dive site called Shotgun. We had the perfect current going west to east in the channel. There were several Giant Trevally on this dive. For the second dive, we went back to Gili Lawa and dived at Crystal Rock. We entered the water a bit later than usual to avoid the crowd. It worked out very well as we had no other groups in the water and had slack tide as well. We entered on the little pinnacle where there was a school of surgeon fish and several giant trevally milling around. We then made our way to the main rock and saw sweetlips, fusiliers, and a bigger school of surgeon fish. Given the nice conditions, we could even circumnavigate the main Crystal Rock. During lunch, we moved the boat to Batu Monco on the north west point of Komodo island and we were the only boat there. We made a nice easy dive on the reef inside the bay to admire some of the most beautiful and healthy corals in the National Park. We then finished our day with one of the most beautiful sunsets of the trip. Early in the morning we left the bay of Batu Monco and headed to Gili Banta. We went for the first dive at the North West corner of the island, also known as Tanduk Rusa. The dive at Tanduk Rusa delivered a special encounter with a sunfish (Mola ramsayi). Most of us watched as the mighty fish came up from depth toward the reef to be cleanded. We then proceeded towards the cleaning station and were lucky enough to spot a manta ray which swam around us for several minutes. 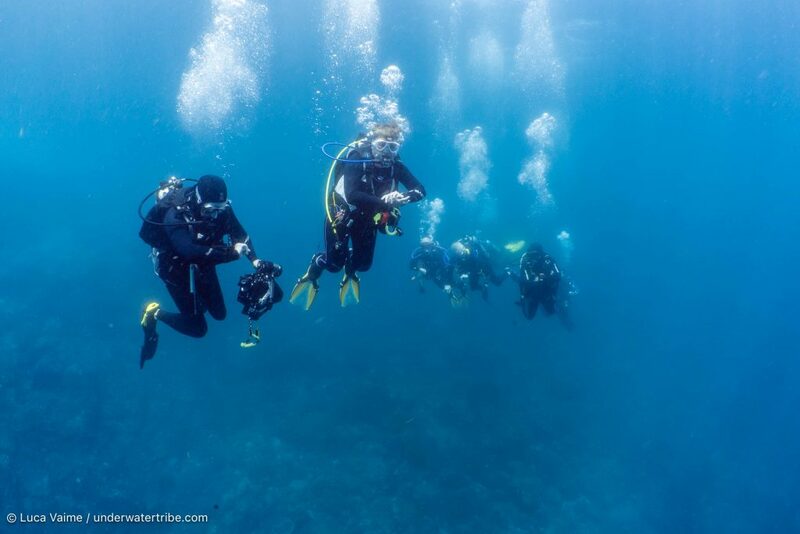 For the second dive we went back to the ancient caldera bay of Banta and dived at K2. At K2 we had the best visibility of the entire trip. The water was nice and warm and we enjoyed a relaxing swim along the healthy coral reef. Steve found an electric clam on this dive and we also encountered several mushroom coral pipefish. Given the great conditions and the small change in tide, we decided to go for the third dive at GPS Point. We had a slight current coming from the west, so we entered a little bit far away from the seamount in order to descend around 25 metres in front of the seamount itself. There was not much action in terms of big fish but we “zig zagged” our way 2 -3 times along this beautiful seamount. A white tip shark, zillions of anthias, and great visibility made this a great dive. 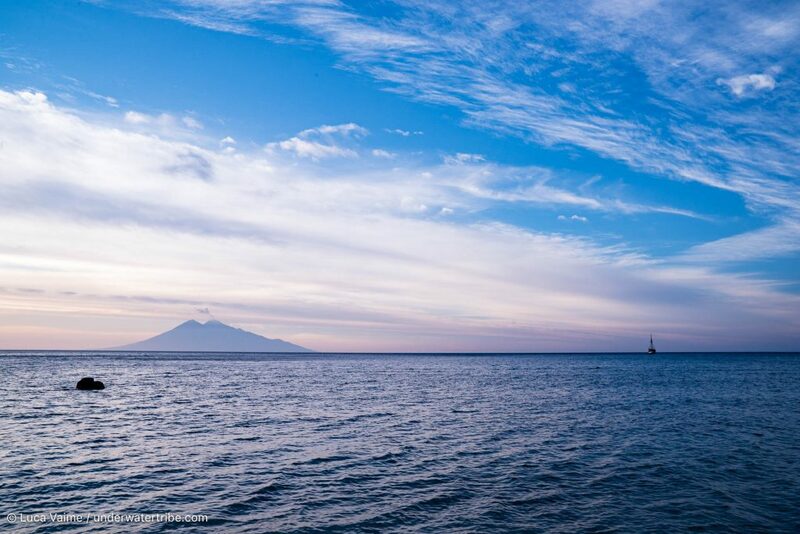 After the third dive, we enjoyed a great sunset overlooking the volcano of Sangeang. After sunset was over, the group went for a night dive at Small World before returning to Komodo island to spend the night there. This was our last full day of diving in Komodo National Park. In the morning we woke up at an anchorage between Gili Lawa Darat and Gili Lawa Laut. Conditions were perfect for diving the GLD Pass and Shotgun, so we did! We first dived GLD Pass and had a great dive, we had a gentle current running through the narrow gap between Gili Lawa Darat and Komodo Island. This allowed us to drift a long way along all the coral heads in the center of the pass. Sharks and jacks were plentiful and we also encountered a turtle eating a big piece of soft coral. We then did Shotgun again as some of the divers missed it the first time and this time the conditions were even better. We had a great visibility with lots of fish and a few white tip sharks sleeping on the white sandy bottom. Once we arrived at the Canyon, we split the group in two. The group led by Derek took the “shotgun” as we normally do but the one led by Luca decided to go through the Canyon and had a little bit more of a “rock and roll” dive in the current. We were all lucky enough to see a couple of manta rays playing in the current. 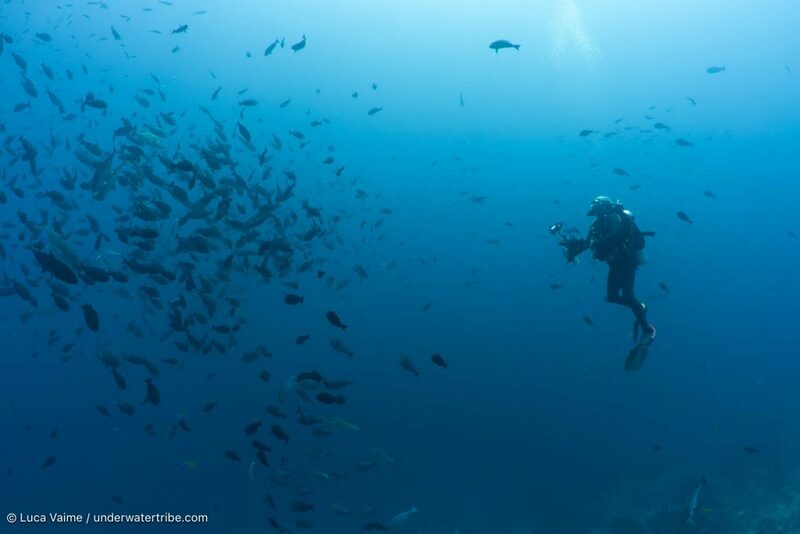 At this point, we were still missing one of the iconic dives in Komodo National Park. The spot we needed to visit was Batu Bolong and the late afternoon was going to have great conditions for this dive. The late afternoon timing allowed us to miss the rush hour of day boats and we were the only ones in the water in the afternoon. We had a great dive with lots of jacks, a huge great barracuda and several turtles. 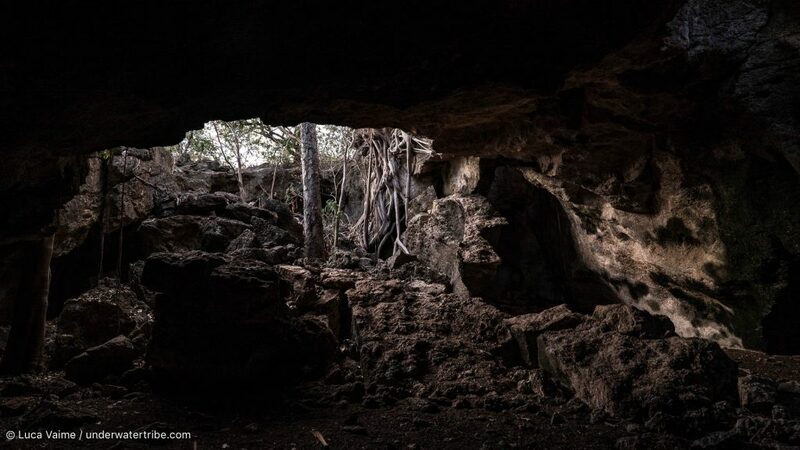 Once the dive at Batu Bolong was over, we moved the boat to Wainilu in the north of Rinca and Trevor and Helen went for a night dive to end another great day. The final day of our beautiful trip had come and even if with just one dive planned, we still had a full day of activity in front of us. We went for our last dive at the beautiful dive site called Tengah Kecil. Conditions were great, with a gentle current that helped gather a large school of fish on the current side of the tiny island. Visibility was very good and we enjoyed the very colourful corals along the slope on a dive exceeding one hour in length. Once the dive was over we moved back to Wainilu and went for a walk at the Ranger Station in Loh Buaya (Crocodile Bay). We had a great walk and encountered several Komodo Dragons, not only at the Ranger Station but also during the walk. We were lucky to see a couple of female dragons guarding their nests, along with a huge water buffalo, few megapod birds, deer, and monkeys. We returned to the boat to have a nice lunch and then off we went again to walk at the village of Rinca. 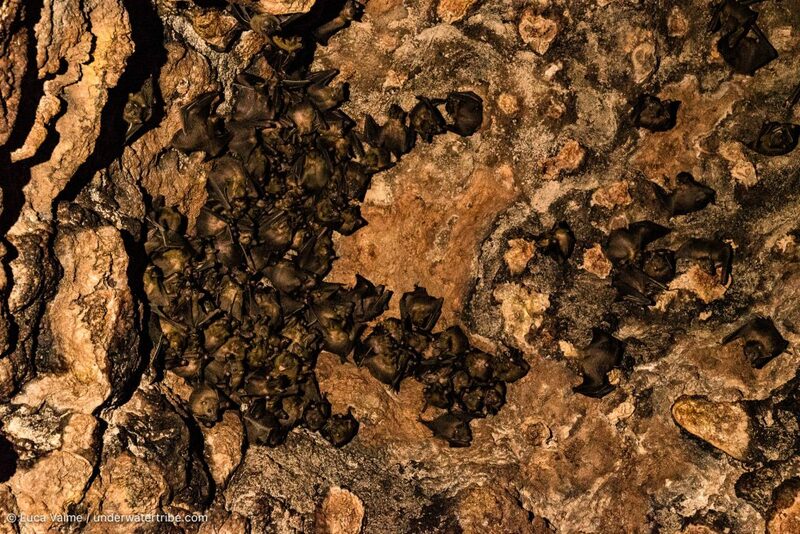 Steve, Nick and Luca went for a guided walk to the nearby hills where they entered a big cave with hundreds of bats living inside. To finish the trip with a great experience, we anchored the boat by the island of Kaba where we watched thousands of bats leaving the island at sunset. This was it for this trip, it was time to head back to Labuan Bajo. To finish this Komodo Trip Report please enjoy the following video.